Lisa Krulasik was awarded first place in the Emerging Jewelry Artist category of the Saul Bell Design Award this year. 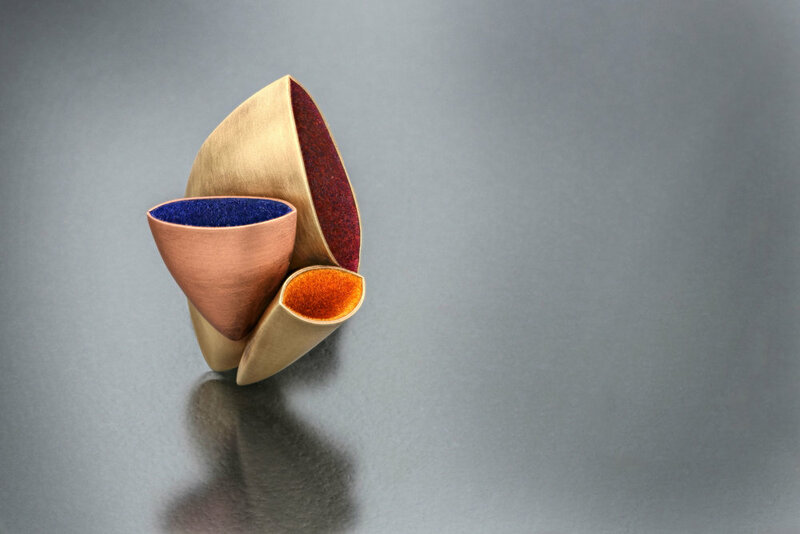 Her piece, "Hollow Brooch," represents complexity in simplicity, a balanced experimentation in geometry. Krulasik spent her adolescence working with colored pencil, pastel, 3D sculpture, and a variety of other mediums. She is a recent convert to the jewelry-making industry, but she's already making waves. WHEN DID ART FIRST COME INTO YOUR LIFE? My parents have told me that I was very creative ever since I was a little child. I would make architectural models and doodle all the time, even if it was not always on paper and instead was on the walls of my home, conveniently behind furniture. People would always say I had a great eye for color and told my parents to never let me lose my creativity. I never really thought I had any artistic talent until my freshman year of high school at The Mary Louis Academy in Jamaica Estates, Queens, New York. There, I started off taking the regular studio art class. Towards the end of my freshman year, my teacher, Mrs. Durkin, asked me if I would be interested in becoming an art major. This would allow me to continue taking art classes for the next three years of high school. I was surprised and honored, so of course I agreed. My sophomore year, I was in drawing, and I fell in love with Prismacolor colored pencils and pastels. Junior year I was in painting, and I used watercolor and acrylic paints for the first time. Towards the end of my junior year, I was asked to be a part of AP studio art program for my senior year, which of course I accepted. I also was lucky enough to take sculpture my senior year as well, which opened the doors to 3D design. Throughout my time at The Mary Louis Academy, I learned so much about art and myself. I never would have thought that I would have such a "hidden talent," as Mrs. Durkin called it, and I knew I was doing something right when I was awarded for my art during those four years. I applied to four colleges, all for art, and chose Pratt Institute. I went to Pratt MWP for illustration, which changed to painting, and then finally changed to jewelry within my first two years there. Now here I am. IN YOUR OPINION, DOES YOUR AGE INFLUENCE HOW OTHERS PERCEIVE YOUR WORK? From the reactions I have received after being a finalist and then winning the Saul Bell Design Award, I think people are surprised that I am so young and that I only have two years of jewelry making experience under my belt. I wanted to be an architect from age five to when I was a freshman in high school. My sophomore year of high school, I fell in love with chemistry and started studying to be a chemical engineer. But, my senior year of high school, when I was applying to colleges to study chemical engineering, something clicked and I wanted to see what would happen if I went to art school. Sure, it was a terrifying few months not knowing if I would get in, and my 10 year plan was going out the window, but I wanted to prove to myself and others that you do not have to be a scientist, engineer, politician, etc. to "be someone." You can be someone by following your true passion and heart. And that is exactly what I did. Now I am slowly finding myself, but I love being surprised by what my life has to offer. And, I love surprising people with my "hidden talents," whether they are science and math related or art related. I love seeing people's faces when I show them something I made. It brings so much pride and happiness to my heart when I can change someone's life in anyway. HOW DID YOU COME TO MASTER HOLLOWWARE SCULPTURE? I am very flattered but I do not think of myself as a "master" quite yet. I definitely do enjoy making hollowware sculpture pieces. They are always a challenge but give you so much pride and happiness when complete. Over time I will make fewer and fewer mistakes along the way, maybe then I will be considered a master. WHAT IS ONE JEWELRY-MAKING TOOL YOU COULDN'T LIVE WITHOUT? This is such a tough question. Of course the basic tools with the widest range of workability are very important, but if I had to pick one tool, I would have to go with my jeweler's saw. Almost every piece starts with a sheet of metal and a saw. There are countless things you can do with your metal once it is cut out, but the first step is always a sharpie outline and your saw blade. WHAT DEFINES GREAT DESIGN TO YOU? A great design is very well balanced. Whether through the forms or materials used, there is a harmony throughout the piece that keeps your eye moving and your mind guessing. My bench is in my small personal studio and is my sanctuary. Every tool and material has a "home," and when I think of my studio, I instantly get very happy. I love walking into my studio with a cup of coffee, turning on my old, beat up MacBook to either play music or Netflix, and getting to work. My bench is where I can think, problem solve, get away, and create. WHAT DOES WINNING THE SAUL BELL DESIGN AWARD MEAN TO YOU? Winning the Saul Bell Design Award is the biggest honor I have received to date. I am still in awe that this happened to me, but I am so incredibly thankful to everyone involved. I think winning this award showed me that I have a talent making jewelry and that I should stick to it and keep going. Right now I am working on my BFA Jewelry Thesis. I need to make at least fifteen major pieces for my show, which is opening spring of 2016. To keep things still under wraps, I am going to be combining my love for structural, man-made geometry with nature's geometry found in reptiles, specifically. I will also be working on making a piece for my next Saul Bell entry. So keep an eye out!